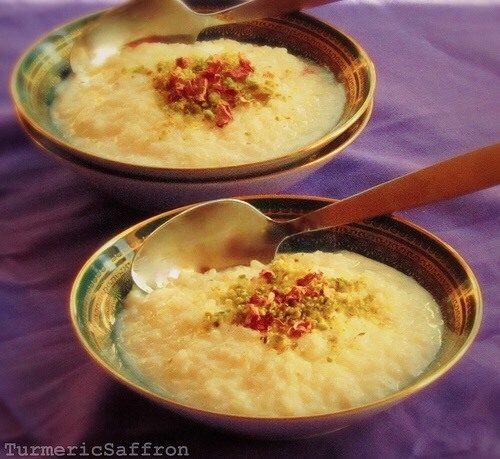 شیربرنج Shir Berenj is a creamy, sweet and rosewater scented rice pudding. 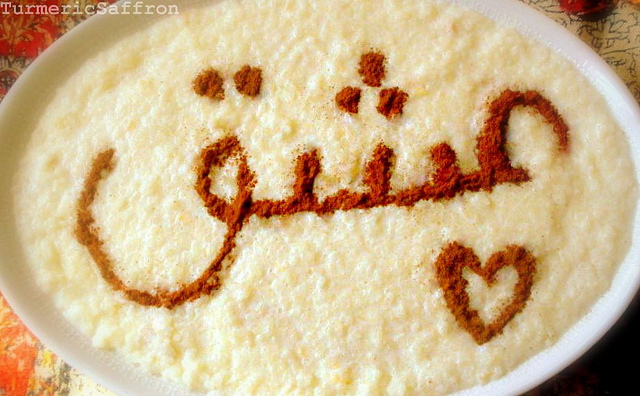 In Persian/Farsi, "shir" means milk and "berenj" means rice. This is my mother's recipe that she used to make frequently. Short grain rice is preferred for shir berenj. As for the milk, since we usually drink 1 percent low-fat milk that's what I used in this pudding too. However, using whole milk is recommended since it would enhance the flavor and makes the pudding more creamy. Rinse rice with cool water and soak in water, preferably overnight or at least for eight hours. Drain. In a non-stick pot add rice and 2 cups of water on medium-low heat, bring to a gentle boil, lower the heat and simmer for about 10-15 minutes or until the rice is tender and the water is almost fully absorbed. Gradually stir the milk into the rice, cook, uncovered, for 30 minutes on low heat, stirring frequently to avoid getting a crusty bottom. This is a dish that we don't want to form a tah-dig at the bottom! Add sugar, cardamom and rosewater. Add more milk if needed. Stir well and simmer on low heat for another 15-20 until it thickens. Remove from heat and transfer the pudding into a large serving platter or single serving bowls or plates. Let it cool. 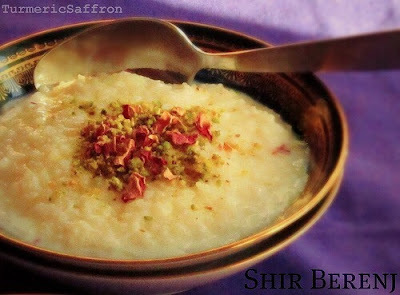 Shir berenj is usually served with drizzled honey on top, rose petal jam or grape molasses (shireh angoor). You can cut the amount of sugar in half if you are using any of the toppings. It entirely depends on your personal taste. thank you. yes, it's written with cinnamon. i'm thinking of making a cut out mold of the word "ishgh" with a much better handwriting! Gosh, I have such fond memories of Shir Berenj. Total childhood comfort food! My mom used to make it for me all of the time. What a coincidence that you would post it this week--I was just trying to come up with a non-dairy version of it. So far, no success, but I'll keep trying. Maybe next time I'll use your recipe for the base and just find a rich, non-dairy milk to use. Bria- the idea of non-dairy milk is wonderful. I'm thinking of coconut milk, almond milk or silk! let me know what you use and how it turns out. Azita, I will keep you posted. I'm thinking a combo of coconut milk and rice milk, but we'll see what ends up working best. 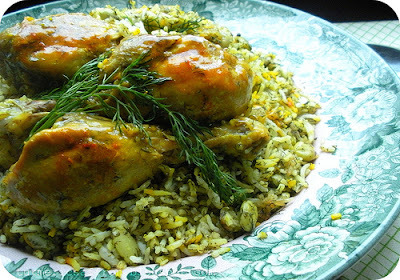 As a non-Iranian having been served wonderful feasts by our Iranian friends as a child, this is one of the first recipes I felt compelled to try to make as an adult. I used an almost identical rice pudding recipe in an Indian cookbook, but added both rosewater & cardamom (probably my very favorite flavor combination EVER and one of the big reasons I fell in love with Persian food!) This was of course before I found your amazing blog. This Easter I was asked to bring a dessert to a gathering of friends. I wanted to bring this, but it needed to be easier to serve. So I did a cross between an Italian Easter rice pie (which is basically baked rice pudding) and this...adding the rosewater and cardamom. It was people's favorite dessert there, even over 4 other fabulous desserts that were more familiar to a western palette. It also made me happy to have a reminder of the beautiful and symbolic Nowruz traditions in my celebration of spring with my friends.